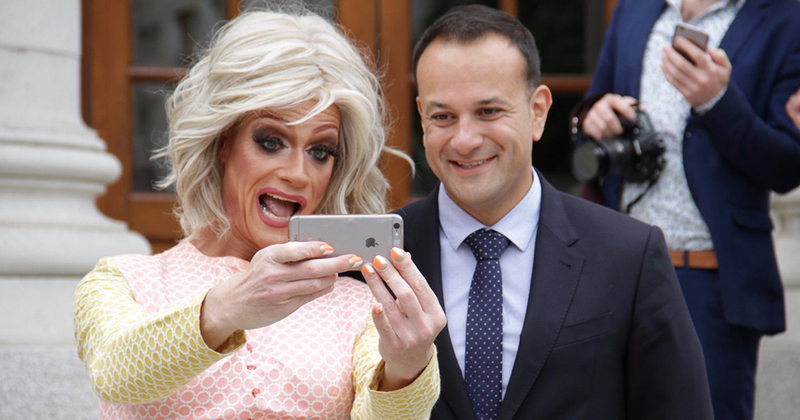 Panti Bliss shared her thoughts on the backlash Taoiseach Leo Varadkar received for his letter to Kylie at the launch of RIOT Live. Rory O’Neill aka Panti Bliss has shared her thoughts on the controversy surrounding a letter written by Leo Varadkar to Kylie Minogue on official headed notepaper from the Office of the Taoiseach. The letter was released following a freedom of information request from a news site. The Office of the Taoiseach had twice blocked the letter’s release saying it “does not relate to matters arising in the course of, or for, the purpose of the Taoiseach’s functions as the head of Government” although the letter was signed “Leo V Taoiseach (Irish Prime Minister)”. The decision to release the letter was appealed but in the end, Varadkar consented to its release. After Kylie cancelled her gig, she rang Varadkar apologising for doing so. At the rescheduled concert date, Varadkar attended with friends and the group had their picture taken with the singer. Speaking at the launch of RIOT Live, Rory said he doesn’t believe there would have been any backlash had the letter been sent by a straight politician. Rory said: “He got bashed for that. I’m always jumping to defend the gay, but if that had been Pink Floyd, do you think there would have been such fuss? No there wouldn’t. “There’s a slight hum of homophobia about it. Every other Taoiseach has gone to things. If it’s because he’s a gay man who likes Kylie? That’s the problem. “Thank god he likes Kylie. If he didn’t he’d be weird. Who wouldn’t have written that letter?